Commonwealth Secretary-General Patricia Scotland has promised to ramp up advocacy for the reform of development assistance rules which member states say are restricting aid to storm ravished countries in the Caribbean. The Secretary-General made the commitment at meetings with leaders in Antigua and Barbuda and Dominica during visits to the countries to discuss Commonwealth support after hurricanes Irma and Maria caused widespread devastation. Today she issued a statement about her trip to the islands. 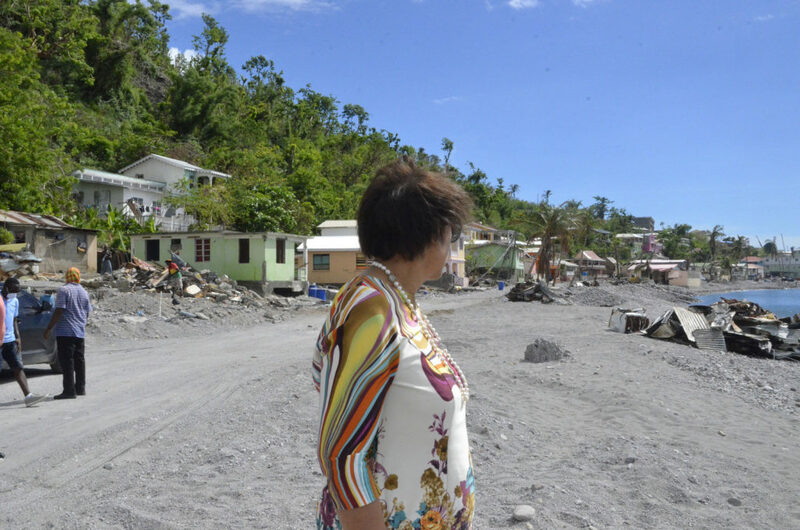 The Secretary-General said, “I knew coming home to Antigua and Barbuda and Dominica was going to be difficult after hurricanes Irma and Maria, but nothing could have prepared me for what I saw or the stories I heard during my visits. Flying in to Dominica, I hardly recognised the country of my birth. Maria has devoured almost all its vegetation. The signature green that used to define this fertile breadbasket of the Caribbean is gone, replaced by brown, bald patches of land and naked trees, stripped of their barks. “When I landed I was heartbroken. It was like an angry giant had stomped all over this beautiful island. Recently built roads were smashed and barely accessible, decades of infrastructure development gone. One of the most poignant moments for me was seeing a woman sitting in the middle of rubble that used to be her home. She just sat there, among the pieces where her house once stood. In 2015 Storm Erika had damaged her house, but Maria picked it up in her mighty hands and crushed it. She and her children, one of them just nine years old, are now homeless. Around the corner my guide, MP Denise Charles, pointed out a collection of storm debris. Another example of a badly damaged road, I thought, but she told me that three house used to stand in the spot. Fourteen people perished when Maria demolished them. 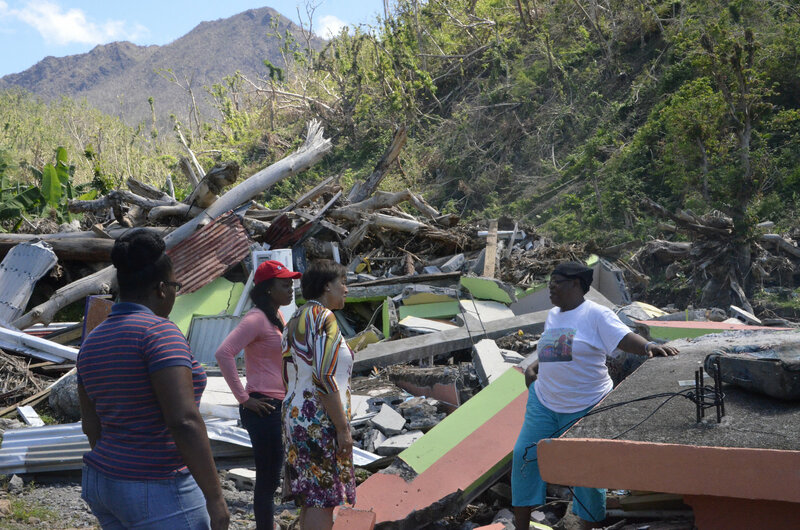 The Commonwealth Secretary-General Patricia Scotland’s visit to Antigua and Barbuda and Dominica to witness the devastation caused by Hurricanes Irma and Maria. “In the historic fishing village of Scotts Head, which holds many fond memories for me, Maria has created a new beach. Before, that beach was a row of houses. It is impossible to tell now that those homes ever existed. All that’s left are small piles of rubble on a stretch of bay sand, and a single fishing boat that somehow survived the carnage. This story of utter devastation, of screams in the dead of night, of burials and memorials, were repeated everywhere I went. No corner of the island is untouched by Maria. “And in Barbuda it is similar story. Travelling through the ghostly empty roads in the evacuated island, was akin to travelling through a bomb site. My guides were speaking about landmarks in the past tense. ‘This used to be a church, that was our police station’. Just two months ago this was a vibrant community. “Walking into a primary school I gazed for a while at the text books, destroyed and scattered around the compound. The children who used to attend this school are now in shelters in Antigua, still coming to terms with the trauma they experienced on the night Irma demolished their island. “But despite this great tragedy and unimaginable devastation, I saw in Antigua and Barbuda and Dominica an unbreakable spirit of resilience and revival. I was able to attend Independence celebrations in both countries. I heard the leaders deliver powerful speeches about rebuilding better, stronger and greener. These countries declared loudly ‘we are still standing and we will continue to rise up from this disaster’. But they need help. “During my visit I met prime ministers Gaston Browne and Roosevelt Skerrit, opposition leaders, Baldwin Spencer and Lennox Linton, as well as members of the diplomatic community and other international organisations who are still on the ground and have done so much to help Barbuda and Dominica. “I promised to do everything in my power to challenge rules that say a high-income but climate vulnerable country that has just lost all its economic sectors and its entire GDP to a hurricane, is ineligible for Official Development Assistance (ODA). We have already seen progress on this after the UK intervened, with donor countries now committing to review the rules. “The Commonwealth is also supporting Antigua and Barbuda and Dominica through initiatives such as our Climate Finance Access Hub. We already have an expert on the ground in Antigua and Barbuda and we are working with Dominica to get someone in as soon as possible to help create strong climate change projects which will attract funding. “The Commonwealth is helping to strengthen legal frameworks to meet mitigation and adaption goals and ensure smooth relief efforts after hurricanes of this magnitude. Our recently launched Office of Civil and Criminal Justice Reform is providing legislative reform guides and drafting tools. We will also make available a legal climate change toolkit which will be launched this week at the United Nations annual climate change conference, COP23.